The guy on the left is my hero. Wearing his regular clothes, sitting up and enjoying the ride, not trying to break any records. Just getting on with it. A true role model for The New Age of Urban Cycling. 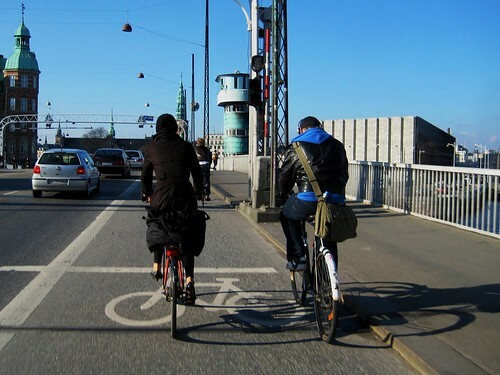 Two Copenhageners cross Knippels Bridge, as Copenhageners have done since this 'new' bridge was opened in 1937. Sure Zak but I wonder if the mutt is aware of that! Yeah but it's fun to go fast every once in a while. I took my two wheeled Italian speed machine out for the first time in a while and it was great fun. But it did take for ever for me to get ready to go to work with it so I'm back to taking it easy. going fast is a blast.